Oxford Hackspace is a non-profit, volunteer-run, member-owned workshop community for gentle people who love to make things and want to see a better world. Both personal projects and professional prototyping are welcome here. We are the oldest hackspace and makerspace in town by 7 years, existing since 2010. In normal times, we operate an accessible workshop, studio and social/event space 7 days a week in the city centre. Here we provide tools and space, offer tool and design training in the tools we have, and run free or cheap interest classes to serve the hacking needs of Oxford’s creative maker community. We also add new tools intermittently based on member interest, on a best effort basis. Thousands of hours of volunteer effort were invested last year in providing this for community benefit. We hold social evenings every Thursday night, hackathons on various social, environmental and just plain fun issues, professional networking events, and games nights amongst others. Our members include crafters, designers, highly-skilled engineers, artists, programmers, and other creative people. If you’re looking for a place in Oxford to work on projects or you are seeking like-minded people to work with, then we may be a good fit. Upcoming pop-up events will appear on our Meetup page here, and big news will appear on our Twitter here. We aim to have new premises back up and running as soon as is practical. We are an inclusive group, and we prioritize providing an oasis-like environment free of life demands or drama, in which people can slow down, use their hands, learn skills, explore ideas, enjoy some personal project time with family or other members of the community, and otherwise develop themselves personally and professionally. This goes for our members, but also for our officers and directors, all of whom are hardworking unpaid volunteers. We also are keen to support worthy and like-minded public projects with volunteer group labour–please get in touch if we can help. 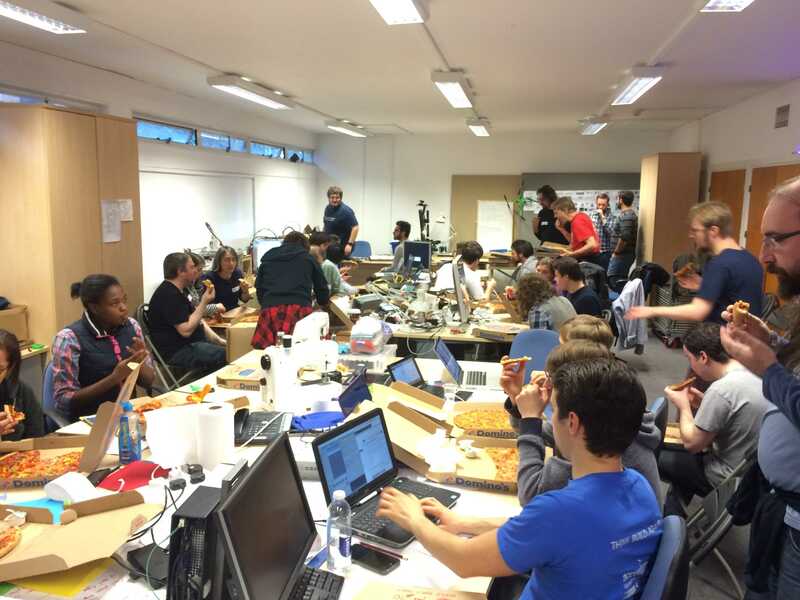 At Oxhack, “making as meditation” and slower, high-quality work and space development are encouraged rather than rush and “do-ocracy” as is the case at some other makerspaces. We find that this approach better supports the personal wellbeing, peace and project progress of our members and officers, promotes excellence in interpersonal relationships, reduces burnout, and generally knits the people of our community together in a more respectful, hopeful, and healthy way. In the end, this contributes to our sustainability as a supportive making space and a place for world-improving social tech ideation. To the extent possible within Oxford’s difficult property market and the capacities of our directors and members, we seek to provide a hackspace that is “accessible” geographically, financially and physically. It is not always possible to do a good job on all of these at once, but for the past eight years we believe that we have managed to strike a fair balance. We seek to replicate and improve on this diversity-wise in the coming new premises, and welcome thoughts on this to directors@oxhack.org. “Hacking” for us refers to activities of crafting, creating art, designing, making, breaking, tuning, repairing and repurposing of items–so “hacking” in the sense of “hacksaw,” not computer hacking.